This morning, we learned that one of the leading real estate blogs in the country, Curbed.com, has been hosting a series of monthly real estate round tables to discuss the state of the housing market in New York City. The Real Estate Cafe and other leading bubble bloggers in Boston began a similar series of collaborative chats 12 days ago, and we were thrilled that our first "Bubble Hour" generated 36 pages of content including over a dozen graphs. Please let us know if you'd like to participate in the next Bubble Hour, and whether you would prefer to participate in an online chat or a offline meeting by emailing [email protected] The Massachusetts Association of Realtors will announce their official February housing report on March 23, 2006. Until then, you can help shape the content of the next Bubble Hour by posting your question below, or recording a message on our blog reader line (617-876-2117) for future use in our real estate podcast. We're eager to add more content to our real estate bubble "audio time capsule." Field reports and market observations from home buyers and sellers in Greater Boston and across Massachusetts are most welcome. 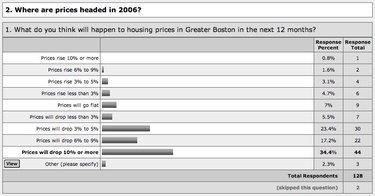 Survey results: Where are housing prices headed in 2006? It's good to be posting original content to The Real Estate Cafe's blog again after our second bout of bloggers block. Like the first time, the slump lasted for nearly 50 days but this time we had an excuse: we've been waiting for enough responses to go public with our 2006 homebuyer survey. The first graph appears above, and if you click on the image to enlarge it, the results speak for themselves. We'll post more results in coming days, as well as commentary on the findings and their potential implications for homebuyers and sellers in Greater Boston. The survey is closed at this point, but you can comment online or by record a sound bite, for potential use our real estate bubble audio time capsule (a.k.a. podcast), by calling on our reader line: 617-876-2117. 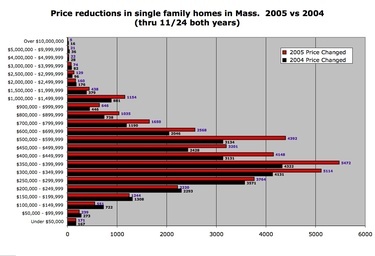 This graph, the fourth in a series of five documenting market trends behind the Boston's Globe's recent feature story, shows side-by-side comparisons of markdowns by price range for single family homes across Massachusetts through Thanksgiving in 2004 versus 2005 (click on image for larger view). As the red bars indicate, price reductions increased in nearly every price range in 2005, but most notably in the mid-market or $300,000 to $600,000 price range. The increase of markdowns in the $500,000 to $600,000 price range is particularly visible in this bar chart, and could translate into savings of tens of thousands of dollars off original asking prices, even before our unrivaled commission rebates. You can learn more about them by reviewing The Real Estate Cafe's menu of compensation plans, or contacting us. As always, your comments are welcome on our blog, or by calling our reader line to record a sound bite for potential use in our audio time capsule of the real estate bubble. Following the Massachusetts Association of Buyer Agents panel at Suffolk University Thursday morning, Sooz and I went to a nearby Starbucks to go over the conversations we recorded with some leading buyers agents in Boston. As we were getting settled, a woman overheard our discussion and jumped in. She described lessons learned over last two real estate cycles: first losing money (at least on paper) on a starter condo purchased at the top of the bubble in Philadelphia in the mid-1980's; then purchasing another home at the bottom of the last cycle; and utimately hitting the real estate jackpot in Altantic City. She and her husband are once again timing the market before making their next move. When asked what advice to she would give to buyers thinking about buying now, she drew from her experience of loss in the mid-1980's. It's a perspective some real estate bubble observers say is too seldom heard in the press today. We invite you to listen in to our conversation at Starbucks. Stay tuned for podcasts from the MABA panel on "Consumer Protection & Home Buying"
Capturing the Real Estate Bubble in an "audio time capsule"
This impromptu audio recording was recorded last week with the help of Susan Kaup. It includes preliminary thoughts about how The Real Estate Cafe hopes to incorporate audio files or a podcast into this blog. We're also excited about creating an "audio time capsule" to capture different perspectives -- from ordinary homebuyers and sellers -- on the Real Estate Bubble of 2005.